Construction leaders Multiplex implemented the BOSS FyreBox at their latest apartment project in Melbourne, the Capitol Grand. 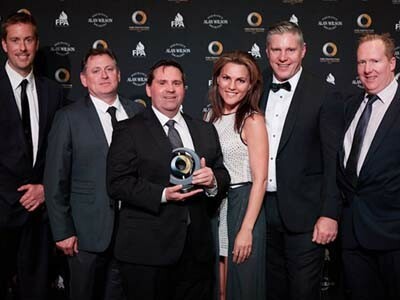 The installation won Multiplex and BOSS Fire the Project of the Year Award at the second annual Fire Protection Industry Awards held in Southbank, Melbourne recently. The independent judging panel said that Multiplex’s decision to ‘think inside the box’ eliminated the risk of non-compliance by using a guaranteed solution. Multiplex’s Damien Jenkins, Project Manager Andrew and BOSS Fire & Safety MD Mark Prior received the prestigious industry award. The BOSS Fyrebox is a transit for multi-service cables and pipes, designed to provide two hours of fire protection. Recommended for residential apartments and commercial buildings, the Australian-made BOSS Fyrebox is manufactured in Caringbah in Sydney’s south.